Hi: Z5500 enthusiast's and anyone interested in the Logitech Z5500. After lots of experimenting for the last couple of years, here's what I just finished making. 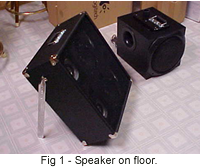 The versatile speaker cabinet can either be set on the floor with optional kick back legs if needed (Fig. 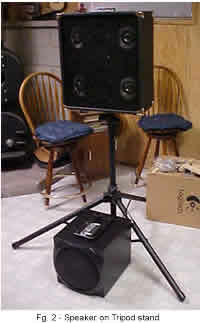 1), or it can be set on a standard tripod (1 3/8" socket) speaker stand (Fig. 2), or mounted on the sub (Fig. 3). The sound on this system seems to get everywhere with very little difference from setting on the floor, or tilted back, or on a speaker stand. 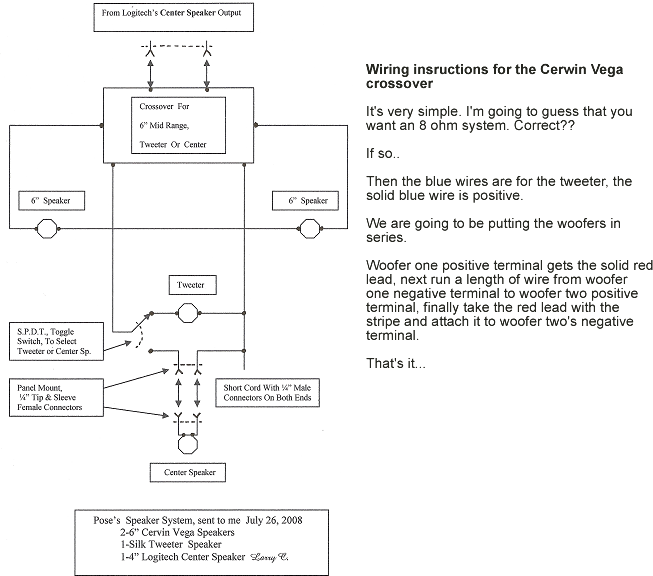 As an added bonus, there is only "ONE" wire to plug in for all speakers! NOTE: click on any of the pictures in this article for a larger view of the photo. To make things easier to set up and more portable and also to get the mid range out on top, I made the below modified changes. 1) I made a speaker mount on the sub, which that includes a heavy duty handle for carrying (Fig 4), with a removable stabilizer device to give it stability. 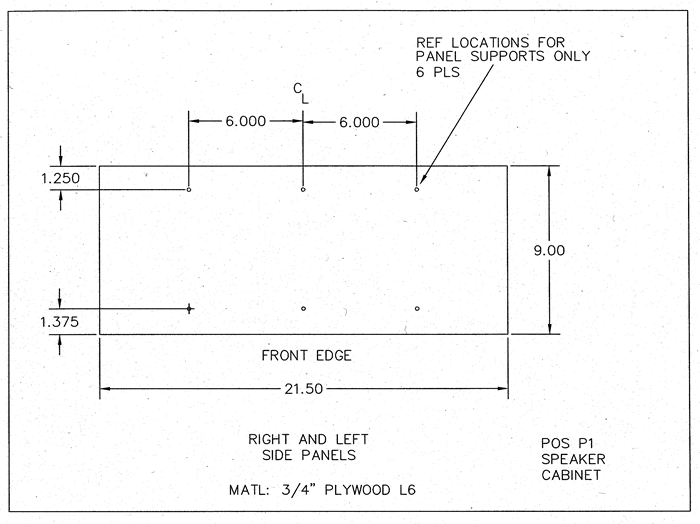 This only raises the cabinet 8.5 " above the Sub (Fig. 5). Total height of the rig is 45 inches. I have found this is a very nice height and seems to work just as good as a higher height overall. 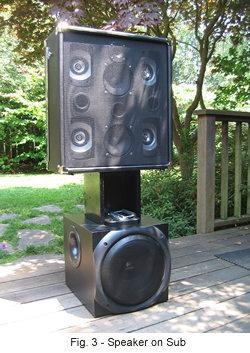 2) I built a speaker cabinet (W 19.5" X H 22.0" X D 9"). 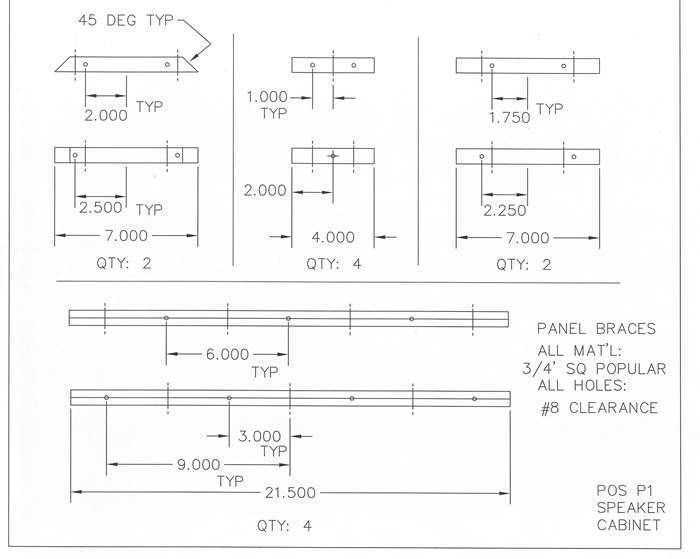 I nailed/screwed/glued 3/4'' birch veneer 10 layer cabinet plywood, for the cabinet and the same on the back and speaker board except those were only 1/2" thickness. I used 3/4" X 3/4" popular for bracing and backing for fastenings for screws. 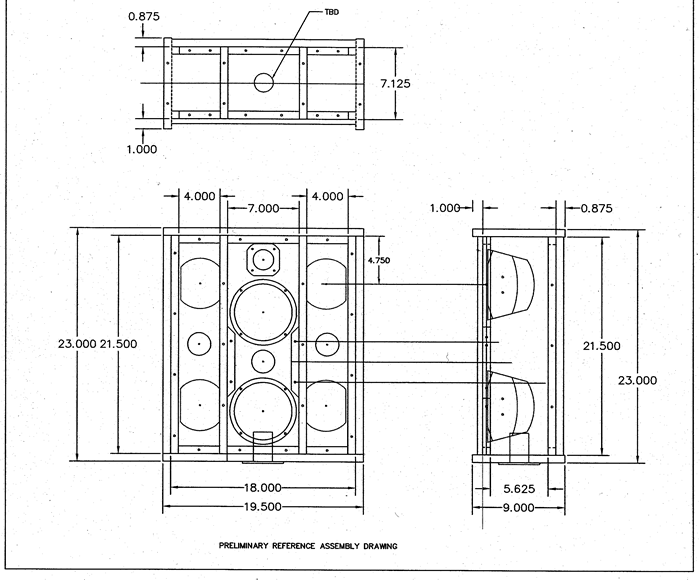 This cabinet is partitioned into 3 sealed compartments with 1 2" air grommet in each. The logitech speaker canisters are mounted to the partitions with 2 - 1/4" machine bolts each and drilled through the back portion of the side on the canisters (where there's a spot that is tapered, looks like a quarter moon) (making 2 lefts and 2 rights) and are mounted Left Front (top left) Right Front (top right) Left Rear (bottom left) Right Rear (bottom right). This only gives about a 5 degree outward spread for these speakers, which should be okay, with the way the z5500 seems to spread the sound everywhere anyway. The Logitech's mid range falls a bit short when using live on a keyboard (actually starts to break at higher volumes.) 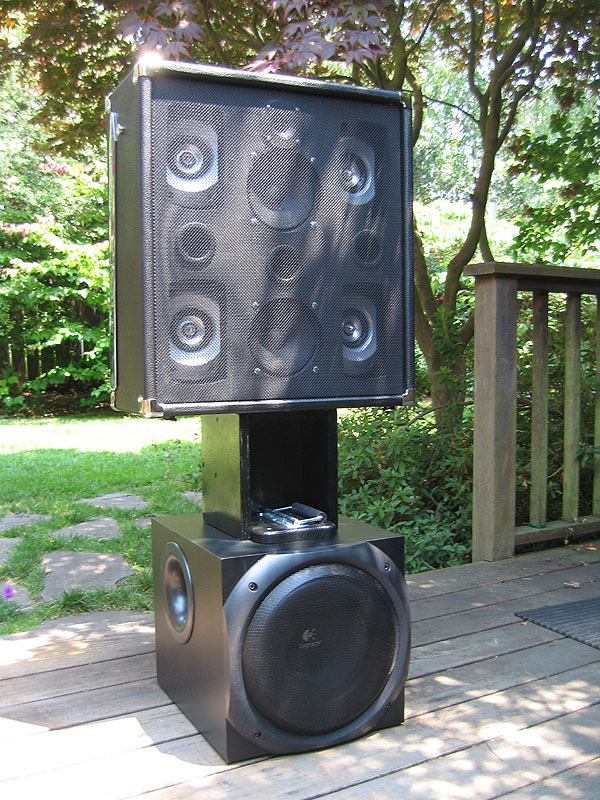 I tried just about every combination of speakers you can imagine with the z5500 system, from using two center speakers together -- which, by the way, does a excellent job -- to 2 Yamaha 15" combo club speakers. I found the 6" give a lot more clarity and two 6" really handles a lot of volume. So I did away with the Logitech Center speaker and replaced it with two Cerwin Vega 6" woofers combined with 1 - 1" tweeter. These were made to be compatible by using a Boston cross/over unit (an electronic device with wires, resistors, capacitors and such that basically just makes everything come out with 8 ohms impedance same as the single center speaker) mounted inside. Was it necessary to add the tweeter? Probably not that necessary, but using a cross/over 3 8 ohm speakers are easy to convert and gave me the option of installing a double pole double throw toggle switch that can mute the tweeter while adding a monitor up on the keyboard if I wanted. 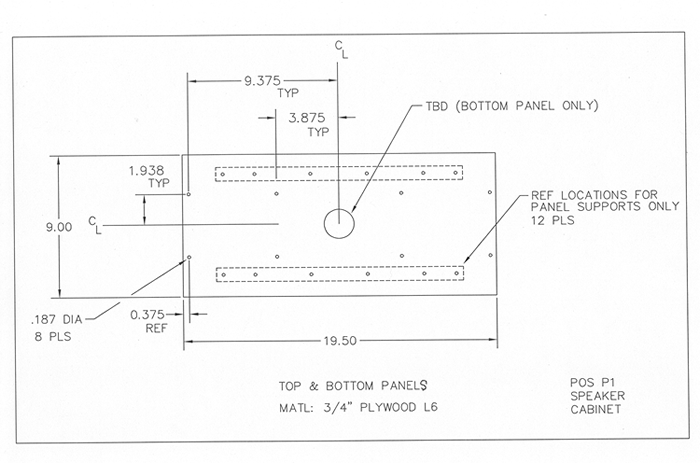 The POZ P2 will have a 1/4" monitor jack on the sub with a toggle switch that changes from tweeter to monitor. The cabinet is covered with Tolex covering using zinc plated corner hardware and fender type feet on the bottom for storing or transporting. 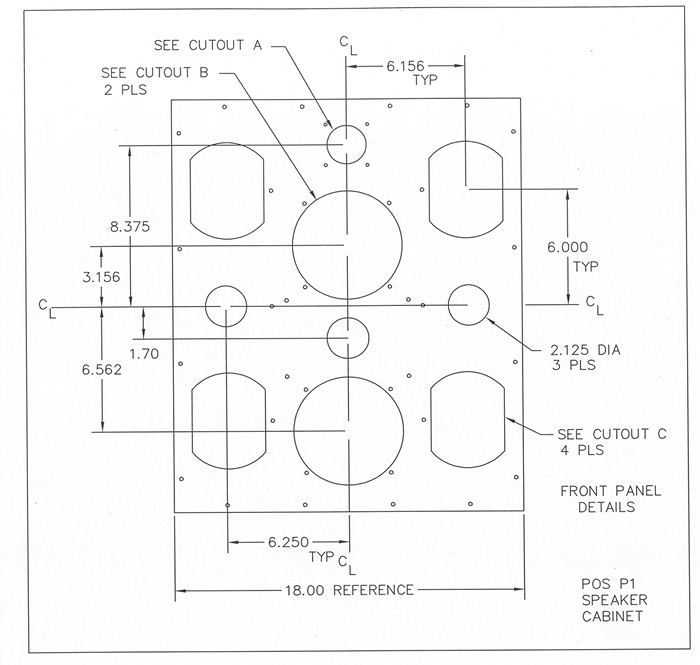 Grill and speakers are recessed inward 1" for transporting speakers face down. 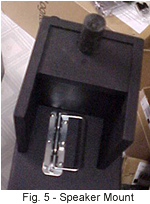 Heavy duty spring loaded handle on top, recessed pole socket on the bottom. 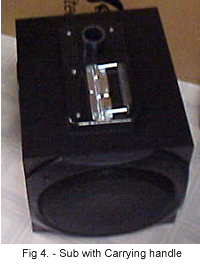 Pole socket on the bottom of the cabinet is a standard 1 3/8" and will take a standard speaker stand. Has Fender 19" tilt back chrome legs mounted on each side. Speaker grill is covered with a tough, more open mesh black nylon type grill cloth. 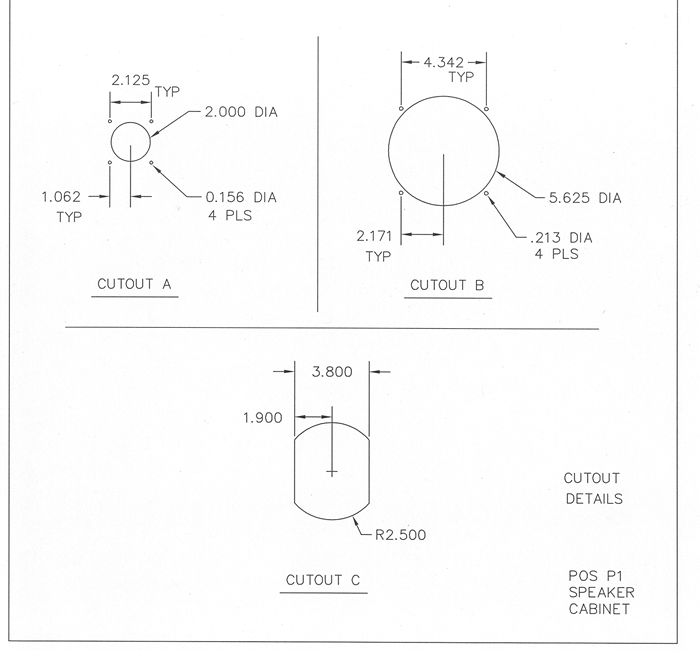 "Basics of wiring Speakers: Loading, Phase and other tips"
"Wiring a 2 x 12 Speaker Cabinet"
"Wiring a 4 x 12 Speaker Cabinet"
I used 2-5 lug solder terminals 1 for pos's. 1 for neg's. to connect all 10 speaker wires inside the cabinet. 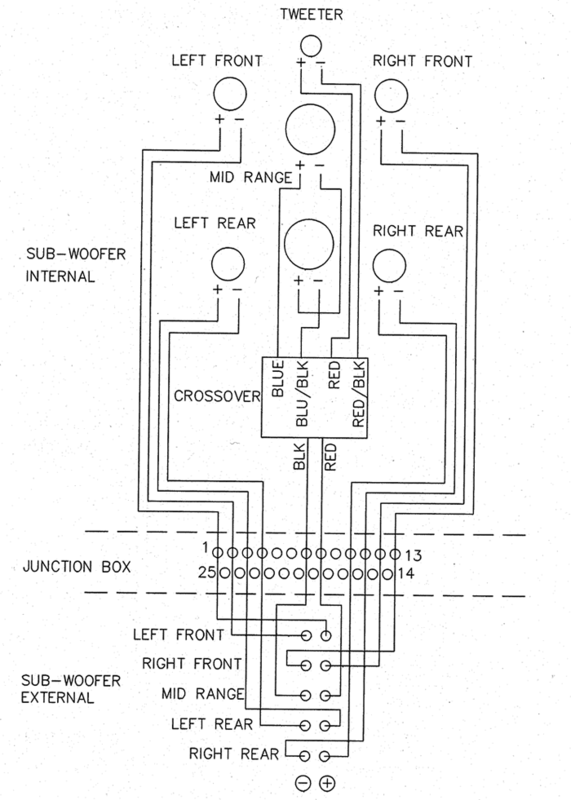 10 wires (5 pairs) (and the 3 center speakers on the Boston cross over only takes 1 pair. # 18 stranded copper wire used to solder in. A 7-pair cable is soldered in to all the components inside the cabinet, this comes out from the bottom rear of the cabinet and has a 25-pin Dsub Computer type female plug on the end. 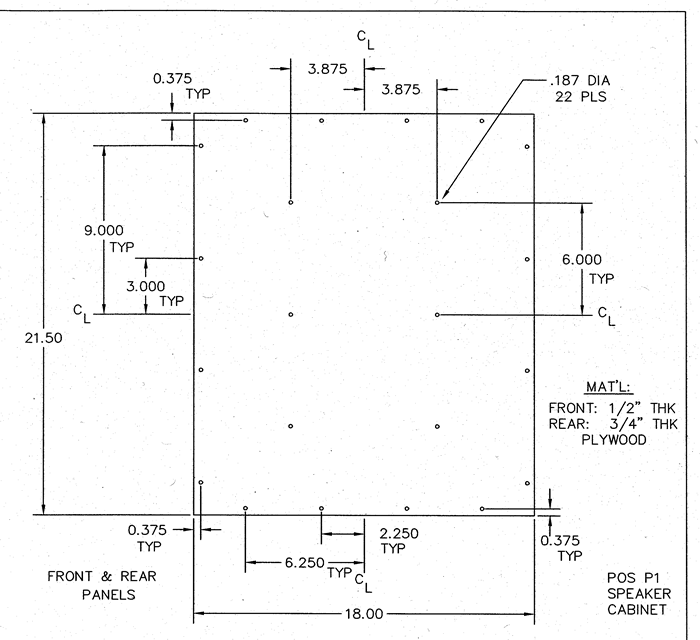 This plugs into a male Dsub plug mounted into a Distribution box ( 2" x 3" project box). 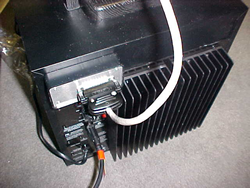 Five pair of wires are soldered into this connector and they plug into the appreciate wire receptacles on the back of the Logitech subwoofer. The cabinet weighed in at 33 lbs. 6 oz on the bathroom scale. (Feels a bit lighter than the subwoofer.) 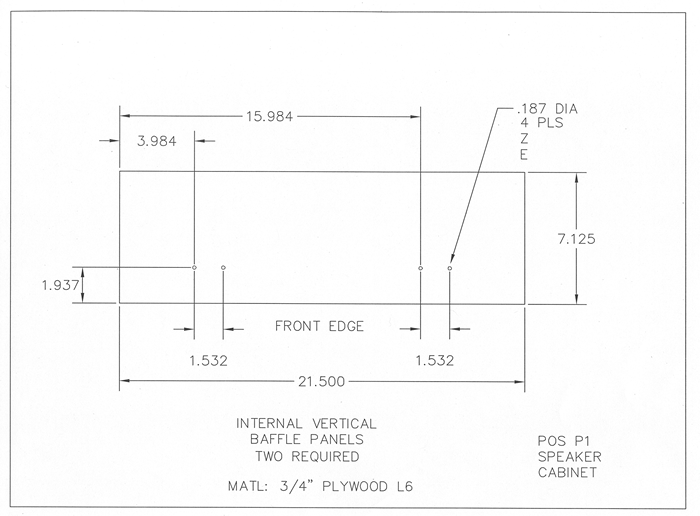 From the top of the cabinet to floor is 45 inches. I made this just to show that a great product can be improved to withstand extensive gigging, and the sound can be made even better for keyboards. The total cost (not counting the labor) was about $460.00 with tax and shipping. I paid $311.00 for the Z5500 2+ years ago. The final product is an excellent keyboard system with terrific sound that fills all the nooks and crannies indoors and out! It will give any expensive amplification system a run for the money -- "MY OPINION!" Also, I'll say the z5500 was improved at least 20% over the tremendous sound it started with by adding the upgraded speakers. They took it from excellent digital sound and added the ability to superbly amplify live vocals as well. The sound is outstanding and makes this rig into a pro rig for sure. It was before, but had bad vibes with little speakers, little wire, no plugs, and just a bit short on mid range when you start cranking it up. I tested this rig with the volume to a point of the walls starting to leave the building and it stayed clear with no breaking down, and this was with the sub set at only 3, and the overall volume set to normal with 11 boost to go. The keyboard volume was at 2 o'clock, the volume pedal on floor was at 80%, mixer was set on 3 for the keyboard and 8 on final out. With this kind of power, you can guess how clean everything sounds on normal volumes. The Logitech is set on music II stereo x 2 with the sub set on 3. On my Tyros 2, the main EQ volume is boosted a couple notches. Compressor sets keep getting changed and tweaked and I have made so many changes down in it's innards I can not tell you what all I've done. Basically, my way of setting the sound (everyone hears and wants it a bit different) Is to bring up the Grand Piano and beat two notes together as a tuner would do while tuning an acoustic piano and just let my ears tell me what's good or bad as I turn every knob I can get my hands on. When it gets to where I like it, I leave it alone. I'm convinced that Yamaha sets its keyboards to make the Grand as delicious as possible and, when it's at its best, all other sounds seems to fall in place. I also run through a small mixer for quick fixes on the fly, and use a Beheriniger Ultrafex 3200 sound enhanser, which lets me add SOS sound and tighten up the bass, mid, treble for different venues. This is affixed to my keyboard stand right under the keys by my left hand so I can spice up a strat or trumpet or make a violin shimmer etc. Thanks for reading, hope you found something of interest in this.